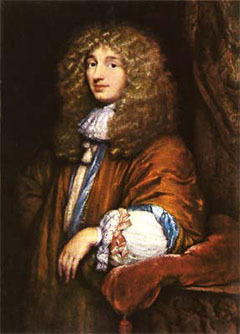 Christiaan Huygens. Public domain image from Wikimedia Commons. The Ancients knew of five planets. They were points of light in the sky, like stars, but unlike the stars they moved around or wandered between the fixed constellations. You could track their movements relative to the stars over many days. Some moved faster than others. The swiftest ended up with the name Mercury, after the Roman messenger god, fleet of foot. The brightest, and second fastest, was named for Venus, goddess of love. The planet with the angry red colour was Mars, god of war. The second brightest, more stately in its movements, became Jupiter, king of the gods. The last planet was the slowest moving by far, so it became associated with the god of time and old age. That Roman god's name was Saturn. Like the other five planets (and the moon and sun), we have inherited a day of the week named after its associated god: Saturday. Saturn was also associated with another time: the Roman festival of Saturnalia. Saturnalia was an end of year celebration marked by a playful overthrow of the normal rules and conventions of Roman civilisation. It involved feasting, gift-giving, and reversal of societal roles, with masters serving their slaves. All of these customs still take place at the same time of year in modern western civilisation, now associated with the occasions of Christmas and Boxing Day (though the role reversal has become much more limited in the last century or two). Saturn has also given us an adjective: saturnine. Its meaning relates to Saturn's ponderous movements across the sky. A saturnine person is dull, gloomy, and melancholy. The reason Saturn is so slow in crossing the field of stars is that it is the furthest away of the classical planets. As Johannes Kepler first published in his Third Law of Planetary Motion in 1619, the time it takes a planet to move around the sun increases as the 3/2 power of the size of the orbit. Saturn, at almost twice the distance of Jupiter from the sun, takes two and a half times longer to complete one orbit. Whereas Jupiter cycles around its orbit in under 12 years, Saturn takes almost 30. Saturn's best known feature was first observed by Galileo with his telescope in 1610. Having seen that Jupiter was accompanied by four moons, he found something much stranger when he looked at Saturn. There seemed to be projections sticking out from either side of the otherwise round planet. Galileo likened them to "ears". He had no idea what they were. 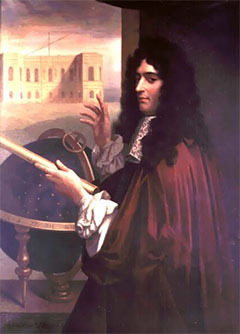 Giovanni Cassini. Public domain image from Wikimedia Commons. The riddle was partly solved in 1655 when Christiaan Huygens made extensive observations of the planet. By watching it over months, he saw the "ears" change shape in a systematic way. Huygens realised what he was seeing was the change in angle as the structures tilted. This allowed him to work out the geometry. He concluded that the "ears" were a continuous ring, neatly encircling the planet and nowhere touching it. Fascinated by the planet, Giovanni Cassini devoted much of his research to Saturn. His telescope was good enough to let him discern some structure in the ring, most notably a gap, splitting it into two separate, concentric rings. The gap is still known as the Cassini Division. What the rings were, or what they were made of, however, remains a mystery for another 200 years. James Clerk Maxwell, the man who laid out the mathematical foundations of electromagnetism, also applied his mathematical skills to the dynamics of the rings. By applying Newton's law of gravity and an understanding of the strength of material objects, Maxwell concluded that the rings could not be solid objects. The gravitational forces at that distance from Saturn would tear apart a continuous ring made of solid matter. He proposed instead in 1859 that the rings were formed of many small fragments, each one individually orbiting Saturn like a tiny moon. Meanwhile, the known structure of the rings had been growing in complexity. in 1837, Johann Encke noticed that the ring outside Cassini's division was not uniform in brightness, but showed some variation across its radius. Then in 1850, William Bond and his son George were the first to observe a third broad ring. It was fainter and inside the two brighter rings that framed the Cassini Division. It has since become known as the C Ring, after the ring outside the Cassini Division was named the A Ring, and the ring inside the Cassini Division was named the B Ring. Later in the 19th century, James Keeler made extensive observations of Saturn's rings. In 1888, he found that the A Ring itself contained a gap, smaller than the Cassini Division but just as distinct. This was named the Encke Gap in honour of Encke's earlier observations. Keeler made an even greater discovery in 1895, when he aimed a spectroscope at Saturn's rings using the Allegheny Observatory telescope. Saturn's rings, showing the bright B and A Rings separated by Cassini's Division. The faint C Ring can be seen inside the B Ring. Public domain image by NASA/ESA from Wikimedia Commons. 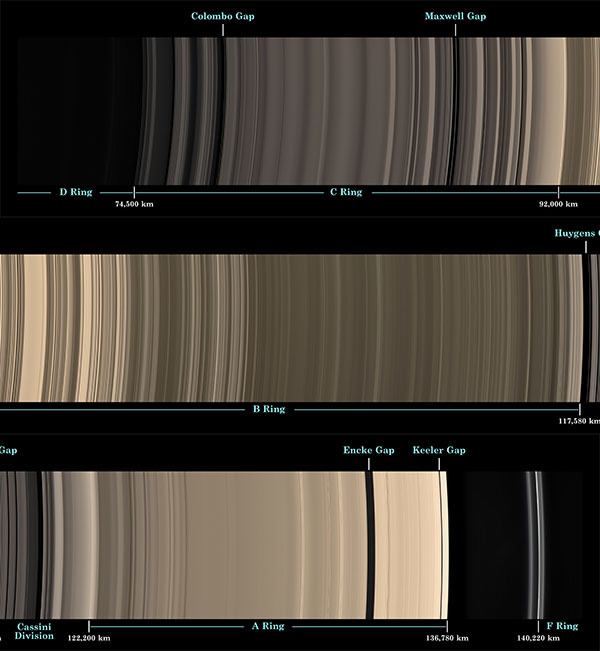 Keeler was able to take spectra from small sub-regions of the rings. This allowed him to investigate the properties of the rings as a function of the radial distance from Saturn. Using the Doppler shift of spectral lines caused by motion of the rings, Keeler was able to show that parts of the ring system that were further away from Saturn were actually moving more slowly than parts closer to Saturn. If the rings had been solid objects, like a CD (or vinyl record, if you remember such things), then when they rotated all parts would have to move at the same angular speed, which means that regions further out are moving faster than regions near the centre. But this is exactly the opposite of what Keeler observed, so the rings could not be solid objects. In fact, the distribution of speeds Keeler measured matches Kepler's Third Law as applied to small particles orbiting Saturn. So he had confirmed Maxwell's theoretical calculation about the physical structure of the rings. The spectroscopic analysis also revealed that the ring particles were mostly water ice. Photographic observations in the 1960s teased out two more faint rings, the thin D Ring inside the C Ring, and the very broad and faint E Ring which covers a huge area outside the A Ring. Further discoveries came with the flybys of the deep space probes Pioneer 11 in 1979, Voyager 1 in 1980, and Voyager 2 in 1981. Pioneer 11 discovered another distinct ring, the thin F Ring, outside the A Ring. The Voyagers sent back the first high-resolution images of the ring system, and in doing so exploded our knowledge of the rings. Detailed structure of Saturn's rings. (Cut into 3 to fit this page. See here for large version.) Public domain image by NASA from Wikimedia Commons. In 1999, the BBC broadcast a documentary series about our solar system, titled The Planets. 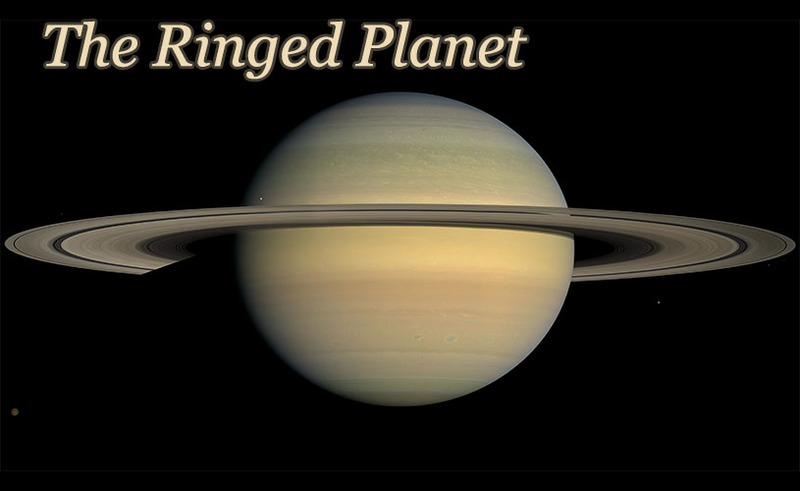 The episode on the gas giant planets featured interviews with Carolyn Porco, a planetary imaging scientist who had worked on the Pioneer and Voyager teams. She described how the images of Saturn and its rings sent back by Voyager were like a veil being lifted from our eyes. We knew the rings were complex and beautiful, but we had no idea until then just how complex and how beautiful they were. What this army of tiny moons does is to cause gravitational perturbations in the ring environment around Saturn. The little nudges provided by the moons push the ring particles into distinct regions and away from other regions. This causes the pattern of gaps and dense ring regions at various orbital distances from the planet. 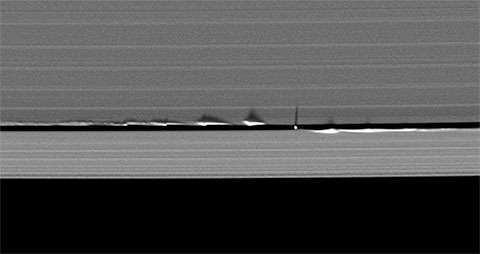 The sharp edges seen at places like the Cassini Division and Encke Gap are caused by moons orbiting just outside the ring, pushing the ring particles away from the gap region. These so-called shepherd moons not only confine the ring particles into detailed concentric patterns, they produce ripples and other effects that move the ring particles up and down, away from the orbital plane. The thin F Ring turned out to have a moon immediately on either side: Prometheus on the inside and Pandora on the outside. As they orbit Saturn, each of the moons pulls material from the F Ring towards itself. But as one moon passes, the next moon is on the way, and pulls the material back in the other direction. Prometheus and Pandora are both highly irregularly shaped, being too small to form spheres. The asymmetries in the system result in the F Ring material being pushed up and down as well as in and out. As a result, the F Ring turned out to be the most complex dynamical system discovered anywhere in the solar system. It actually consists of a central, almost circular ring, surrounded by particles that form another ring spiralling around the central ring. Ripples in the rings in the wake of the moon Daphnis, which orbits in the Keeler Gap. Shadows are cast by the ripples on the rings. Public domain image by NASA from Wikimedia Commons. Other moons cause vertical ripples in the edges of the nearby rings as they pass, leaving a kind of wavelike wake behind them. Seen from the correct point of view, these ripples cast shadows on the rings, forming the most amazing and beautiful patterns. Voyager also discovered a second relatively large gap in the A Ring. The first, discovered by James Keeler, was named for Encke. The Voyager team decided the second gap should be named the Keeler Gap. But the strangest phenomenon discovered by Voyager were radial shadows on the rings. The science team called them "spokes" because they resembled bicycle wheel spokes. They rotated around the planet, staying stable for several rotations. If you remember Kepler's Third Law, it becomes clear that these features cannot be directly associated with the separately orbiting ring particles, as they move at different speeds and will get out of synch very quickly. For a while there was no known physical explanation for these mysterious shadows. The answer came when Carolyn Porco realised that the spokes were rotating at the same speed as Saturn itself. They were not tied to the ring particles, but to the planet. The only thing that far away from Saturn that would rotate at the same speed as Saturn was the planet's magnetic field. Porco made the connection and realised that the spokes are caused by magnetised dust particles, tracking the passage of Saturn's magnetic field as it sweeps through the rings. Porco said of this moment, "I'll never forget when I realised there was this connection - it was tremendous to know something that no one else on the planet knew." Infrared image of the surface of Titan taken by Cassini. Public domain image by NASA from Wikimedia Commons. The BBC interviews with Carolyn Porco concluded with her saying that although we then (in 1999) knew much more about Saturn and its rings than we had before 1980, there was still plenty more to learn. There were still mysteries about Saturn. The probes had concentrated on the most significant feature of Saturn visible from Earth, its rings. But Saturn also has several moons, including the second largest moon in the solar system: Titan. Second only to Jupiter's massive moon Ganymede, Titan is unique in its own right for a major distinguishing feature that makes it arguably more interesting than Ganymede. Titan has a thick atmosphere. From Earth, Titan is an obscured ball, much like Venus, smothered in clouds. The moon was discovered by Christiaan Huygens in 1655, the same year in which he resolved Galileo's "ears" into the rings of Saturn. It was the next moon in our solar system to be discovered after Galileo observed the four main moons of Jupiter. In 1944, Gerard Kuiper concluded from observations of the moon that it had an atmosphere containing methane. In 1980, Voyager 1 passed close to Titan, specifically to capture close up images of the moon. Unfortunately, the atmospheric haze foiled this attempt. The Voyager 1 images of Titan show only a featureless ball. Given this, the Voyager 2 mission the following year was modified to concentrate on Saturn's ring and other moons. It barely looked at Titan at all. Later, spectroscopic observations from Earth teased out some of the atmospheric constituents of Titan. 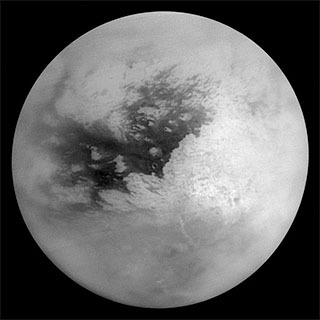 Planetary scientists realised that given the atmosphere of nitrogen, methane, and other hydrocarbons, combined with the temperature of the moon, Titan could contain surface features consisting of frozen and liquid hydrocarbons, and possibly a weather cycle involving rain and evaporation of liquid methane. With an atmospheric pressure equal to 1.4 times that of Earth, making it the closest atmospheric pressure to Earth anywhere in the solar system, it seemed Titan might be a very interesting place indeed. We needed to know more about Titan. NASA joined forces with the European Space Agency and Italian Space Agency to work on a combined deep space probe mission to Saturn and Titan. The mission was named for the two astronomers most historically connected with Saturn: the Cassini-Huygens mission. 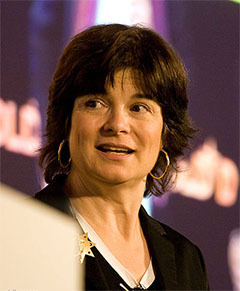 In 1990, The leader of the science imaging team for Cassini-Huygens was chosen: Carolyn Porco. The probe took almost a decade to design and build, and it was launched in 1997. In 1999, on the BBC Planets documentary, Porco expressed how difficult it was to have to wait until Cassini-Huygens arrived at Saturn in 2004. The sense of expectation and excitement, of new discoveries just around the corner, was palpable in that television program. Carolyn Porco. Creative Commons Attribution-Share Alike image by Eirik Solheim from Wikimedia Commons. 2004 has now come and gone. The Cassini orbiter successfully went into orbit around Saturn on schedule in 2004. On Christmas Day it launched the Huygens part of the probe, an entry probe that descended into the atmosphere of Titan in January 2005. It analysed the composition, temperature, and wind speed of the atmosphere. It returned aerial images of Titan's surface as it descended by parachute. It also returned an image of the surface of Titan, taken after it landed. The aerial images showed what looked like lakes and river channels on the surface. Huygens landed in a dry region, showing a landscape of scattered icy rocks. Cassini is also equipped with radar to allow imaging of the surface of Titan through the clouds. This has revealed a topography and geology of the moon reminiscent of many features seen on Earth: mountains, lakes, rivers, and even sand dunes. As of this writing, Cassini is still in orbit and returning new science data on Saturn, its rings, and Titan. It has revealed that the large lakes on Titan, composed of liquid ethane and methane, are stable over several years. Cassini has also supplied Porco and her team with mountains of new data on Saturn, several newly discovered moons, more details of the ring system and its dynamics, and detailed data on the moon Enceladus, including the discovery of geysers and cryovolcanoes on the moon. Even Saturn itself is revealing new secrets, with detailed observations of storm systems in its atmosphere. Cassini is now on a death spiral, with its current orbit designed to decay to the point where it will collide with Saturn's atmosphere in 2017. Until then it should continue to provide further observations. The collision itself will also provide an important science opportunity as it stirs up the gases in the planet's atmosphere. I hope to read about Carolyn Porco's observations and discoveries about Saturn for several years to come. The moons don't literally push the ring particles. Gravity is an attractive force, so the moons pull on the ring particles. It's the interaction of this pull with the differing orbital velocities and the gravitational field of Saturn itself that effectively confines the ring particles into certain orbits. Last Modified: Sunday, 15 December 2013; 22:12:27 PST.